Vancouverites sure do love their ice cream. 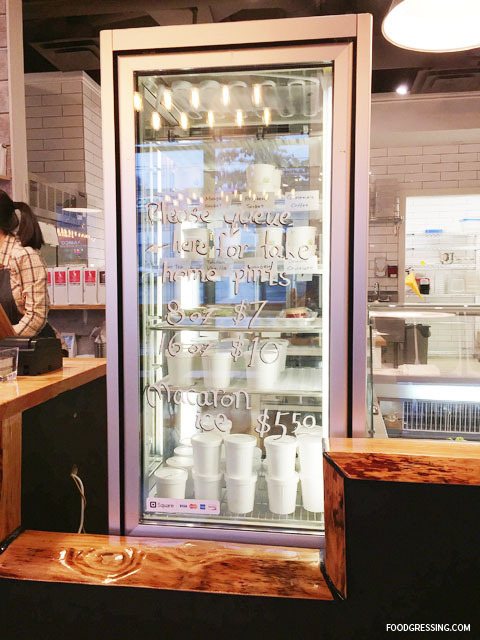 A new ice cream eatery, Tangram Creamery, opened last month in Kitsilano with much enthusiasm from local ice cream lovers. I had seen many mouthwatering social media posts about Tangram Creamery and was eager to try their offerings. 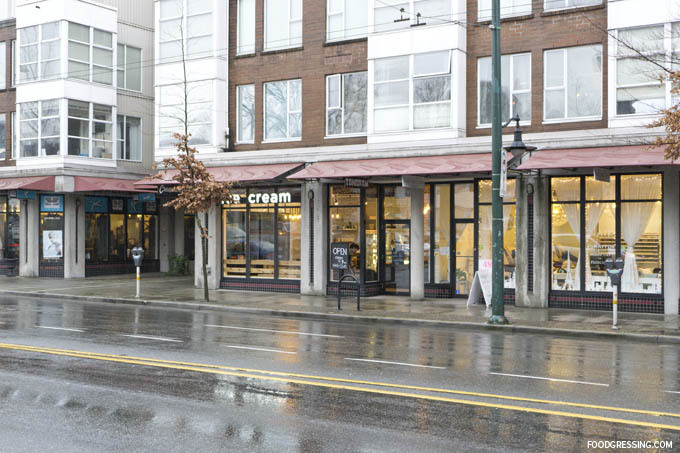 Yesterday, I made by way to Tangram Creamery to find out more about Vancouver’s latest addition to the dessert scene. 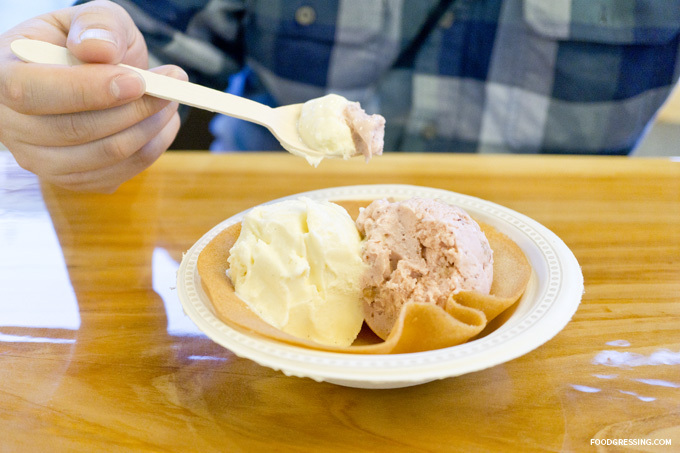 Located at 2729 Arbutus Street, Tangram Creamery makes their gourmet ice cream in-house. Their flavours rotate but the ones offered during my visit included Tahitian Vanilla, Double Chocolate, Guatemala Coffee, Matcha Green Tea, Hoji Cha, Salted Caramel and Strawberry Strudel. 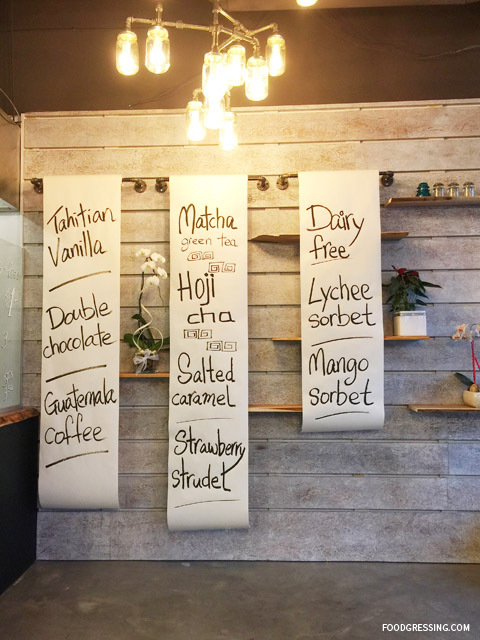 Dairy-free options include Lychee Sorbet and Mango Sorbet. Customers can indulge in a single scoop ($5), double ($7) or triple ($9) scoop. Take-home pints are available in 8 oz ($7) and 16 oz ($10). 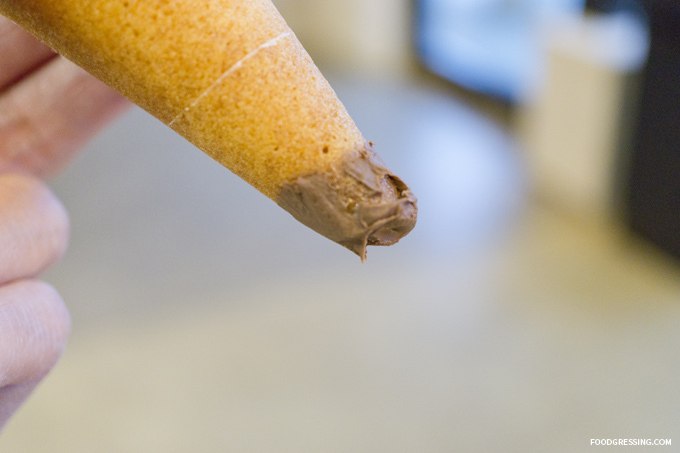 What is unique about Tangram is that they offer handmade Langue de Chat cones also known as cookie cones. Langue de Chat are French cookies shaped like a cat’s tongue. These cones are an extra $1 but they’re worth it (more on that later). Tangram also offers macaron ice creams ($5.50) – a lovely merger of the two finest dessert items created (at least in my opinion). Coffee lovers will be happy to know that Tangram also serves espresso-based drinks ($3-4) made with their own coffee beans. 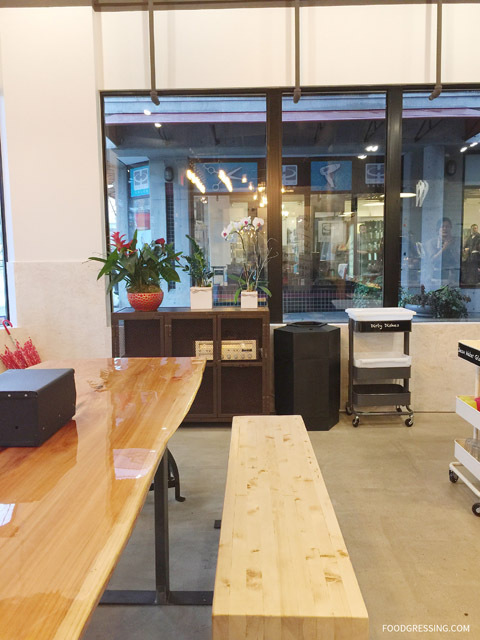 The interior of Tangram is welcoming, bright and modern with a few benches and a large communal table. The environment felt very relaxed and seemed like a great space to enjoy delicious treats with friends and family. First of all, I must mention that the staff at the front were very friendly and allowed me to try as many flavours as I wanted. Samples were on stainless steel spoons rather than disposable ones. My husband and I shared two desserts. 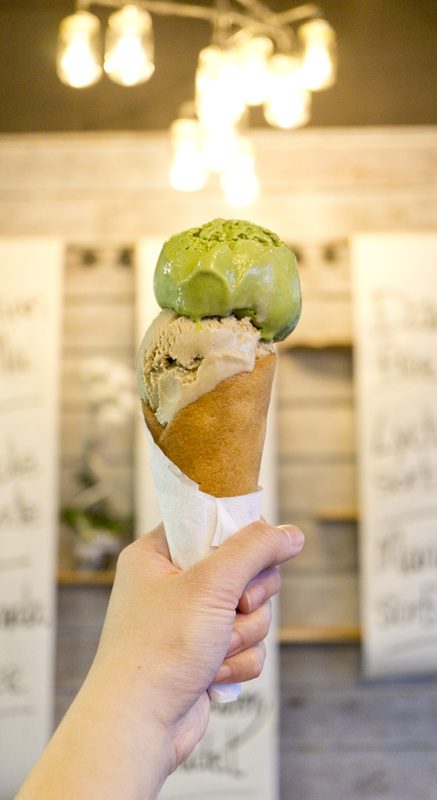 The first was a double-scoop of Matcha Green Tea and Hoji Cha in a cookie cone ($8). Hoji Cha is roasted Japanese green tea. We also had the Tahitian Vanilla and Strawberry Strudel in a cookie bowl ($8). All of the ice cream we had were strong in flavour, no cheaping out on ingredients here. Being a tea-lover, I really enjoyed the Matcha Green Tea and Hoji Cha. The classic vanilla and strawberry combo went well together, and I enjoyed the strudel bits in the strawberry flavour. In terms of texture, Tangram’s ice cream is not the creamiest but I appreciated that the flavours were not overly sweet. 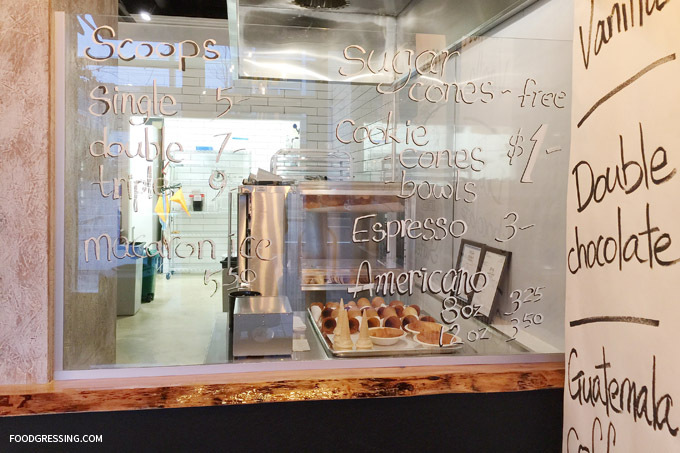 The cookie cone is well-worth the extra dollar. It was light, crispy, buttery and flaky – stuff that dreams are made of. The cookie cone is sweet which offsets the subtlety sweet ice cream. Furthemore, the bottom of the cookie cone is dipped in chocolate which is a fun touch. For more information on Tangram Creamery, visit them on social media (Facebook, Twitter, Instagram).